A Doyle Brunson personal appearance, Doyle Brunson speaking engagement, or Doyle Brunson endorsement will reflect well on your company. To hire Doyle Brunson now for any corporate appearance, fundraiser, motivational speaker event, personal appearance, autograph signing, or website endorsement please contact our celebrity agents at 1-877-6-SPORTS. We will contact Doyle Brunson or contact Doyle Brunson's agent and provide you with the booking fees and availability immediately upon your request. Direct Sportslink is the only sports speakers bureau and talent booking agency based in the United States securing only sports talent for corporations, associations, and organizations for motivational speaking engagements, personal appearances, and endorsements. We are the premier sports celebrity booking agency and a sports celebrity procurement expert. Accordingly, we will provide you with any relevant Doyle Brunson website information and booking agent details so that you can hire Doyle Brunson for your next event. 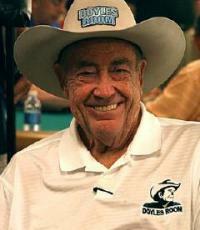 Doyle "Texas Dolly" Brunson was born August 10, 1933 in Longworth, Texas and has played poker professionally for over 40 years. He is a former world champion of poker and the author of several poker books. The first player to earn $1 million in poker tournaments, Brunson has won ten World Series of Poker bracelets throughout his career, tied with Johnny Chan and Phil Hellmuth for the record. He is also one of only four players to have won consecutive main events at the World Series of Poker, in 1976 and 1977. 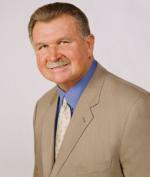 Brunson obtained a bachelor's degree in 1954 and a master's the following year. After graduating, he took a job as a business machines salesman, but on his first day, he was invited to play in a seven-card stud game and earned over a month's salary in under three hours. He soon left the company and became a professional poker player. Other than his poker success, his greatest achievement is probably the book that is considered to be the bible of poker: Super/System. Originally self-published in 1978, Super/System was the book that transformed poker by giving ordinary players an insight into the way that the professionals like Brunson played and won, so much so that Brunson believes that it cost him a lot of money. An updated revision, Super/System 2 was published in 2004. Besides Brunson, several top poker players contributed chapters to Super/System including Bobby Baldwin, Mike Caro, David Sklansky, Chip Reese and Joey Hawthorne. The book is subtitled "How I made one million dollars playing poker", by Doyle Brunson. 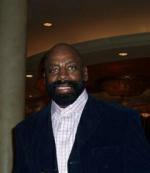 Brunson is also the author of Poker Wisdom of a Champion, originally published as According to Doyle by Lyle Stuart in 1984. Brunson has the honor of having two Texas hold'em hands named after him. One hand, a Ten and a Two of any suit, bears his name as he won the No Limit Hold 'Em event at the World Series of Poker two years in a row with them (1976 and 1977), in both cases completing a full house. Doyle has expressed his displeasure at being known for what is a weak starting hand in Texas Hold 'em; in fact, in both 1976 and 1977, he was the underdog, requiring Brunson to come from behind both times. Another hand known as a "Doyle Brunson," especially in Texas, is the Ace and Queen of any suit because, as he says on page 519 of the Super/System, he "never plays this hand." Based on your interest in Doyle Brunson as a speaker or for a personal appearance, Direct Sportslink has provided you additional links below for other sports talent with similar appearance fees, speaker topics, and categories that match Doyle Brunson.